Brief：The Butterfly Emporium is intended to be one of the highlight features and will form the gem in the integral component of the main attractions of the Tamana InTech Park (TIP) at Wallerfield. 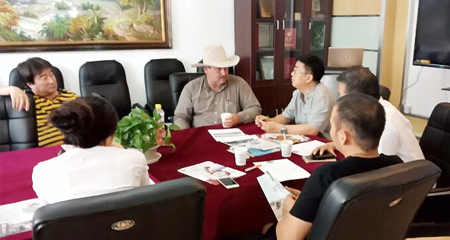 The investment being sought is for an entity either as a sole investor or a joint venture with local and/or foreign partners to undertake the construction and long term operation of this facility. The Butterfly Emporium is intended to be one of the highlight features and will form the gem in the integral component of the main attractions of the Tamana InTech Park (TIP) at Wallerfield. The proposed site, approximately fifteen (15) acres, is immediately south of the Flagship Building. The total area of the facility would be 2764 sq m inclusive of outdoor facilities. The estimated number of visitors per day is 330 to 425 persons. There are over six hundred (600) species of butterflies in Trinidad & Tobago, including one of the most beautiful tropical butterflies, the brilliant Blue Emperor Butterfly. Butterflies are environmentally sensitive species that are affected by minor changes in ecosystems, and can thus be used as key bio-monitoring indicators. As part of e TecK’s Tamana InTech Park vision to achieve harmony between physical development and natural and social environment as the premier eco-industrial park in the region, there is the critical need to enhance and add value to the park using its ecological spaces. This is symbolised through practical features of sustainable development design and the establishment of a world class Butterfly Emporium as its foremost showcase as part of the Linear Park. 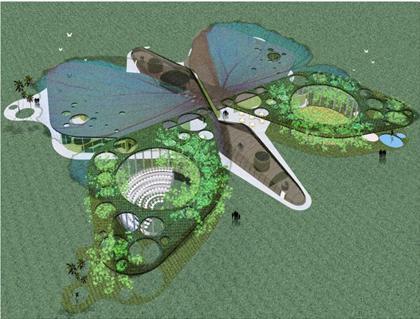 The project’s mission is to develop a Butterfly Emporium that will be designed as an environmental and sustainable showcase both in building design and function; and will be used as an environmental education and research centre for on-site and off-site visitors, displaying Neo-tropical butterflies and plants of Trinidad & Tobago. Visitors to the Butterfly Emporium will have the experience of interfacing with native, vibrant butterflies fluttering atop a lush tropical canvas of foliage and flowers; the experience of the butterfly rainforest. The live exhibit houses native, tropical plants and trees to support 20 to 30 different species and approximately 1600 of free-flying butterflies at any given time. Guests can stroll through the butterfly rainforest on a winding path and relax to the sounds of cascading waterfalls year-round. sciences, helping growth in these areas. • Aid in the development and branding of Trinidad and Tobago as a tourism destination. have, so far, not taken proper advantage of. • Add to the quality of life as expected in a nation striving for developed country status. The investment being sought is for an entity either as a sole investor or a joint venture with local and/or foreign partners to undertake the construction and long term operation of this facility. The estimated Development Cost of Butterfly Emporium is TT$ 113Mn (US$17.7Mn). The investment would be recovered by putting in place an entrance fee as well as the retailing of food and drink and paraphernalia at the facility.